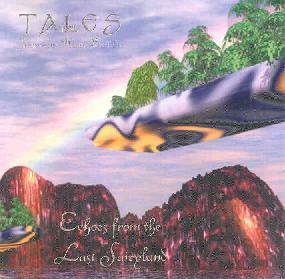 Tales - "Echoes From The Last Fairyland"
Kandhelian: where are these forests? Kandhelian: and where can I find the three moons' mainland? This exchange is from the liner notes of the fifth release from Jean-Luc Hervé Berthelot's (aka Tales), Echoes From The Last Fairyland, which is the second volume of the Merlin trilogy. Berthelot's music consists of carefully constructed electronic space journeys. The kind of music that tells tales and conjures up imagery... just perfect for a story about fairies, elves, unicorns, and gentle wizards. Throughout the album one hears some classical influences and symphonic keyboard progressive, but it predominantly consists of ambient space music that focuses on theme development that massages the listener's mind and communicates the story through music and sound. More than the previous two Tales albums I've heard, the music kept me continually focused on the song titles and imagining the events that might be taking place. One of my favorite tracks is "The Wizard Of All Times", on which a dark cosmic atmosphere unfolds while an efx'd conversation transpires amongst various other sounds and extraterrestrial space whispers and Tangerine Dream styled sequenced patterns. In summary, this is by far my favorite of the three Tales CD's I've heard to date. At times I was reminded of Klaus Schulze, Tangerine Dream, and even a spacey version of Yes. For more information you can visit the Tales web site. Contact via snail mail at SIT Records; c/o Berthelot Ltd; Res. Gaston Roulaud; B5/817; 93700; Drancy; France.